Increased member registration, utilization, and other quantifiable improvements are benefits of custom designed portals that follow design best practices while adding a dash of creativity. Taft-Hartley portals should at a high level be easy to access, use, provide participants comprehensive access to their benefits information, and serve their needs to obtain answers to critical questions or transact with the fund at any time and on any device. These 5 core features are the fundamentals of a successful Taft-Hartley secure portal. 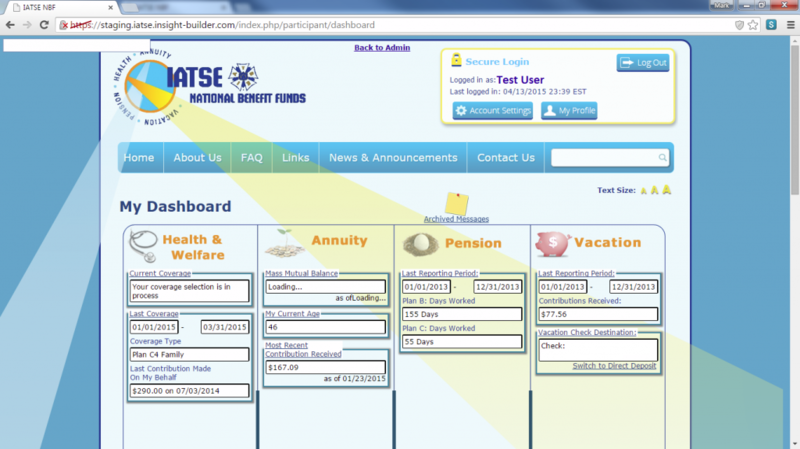 A comprehensive “member dashboard” presents participants with a bird-eye view of all their benefits after login consolidating all members’ key eligibility, pension and annuity information into one screen. This “zero-click” information panel answers most members’ questions immediately, and links to more detailed information as well, delivering information and speeding navigation. Making member information readily available helps keep members involved and informed with the fund. Special control panels developed for the Fund offices and Local Chapter managers provide real-time information on participants, employers and other stakeholders allowing you to gain high level visibility into the issues faced by your organization. For example, employers late in submitting remittance reports or paying their contributions to the funds can be identified much faster with a custom report. Participant utilization reports help identify which participants are actively involved with benefits and generally how well a portal or web site is answering their benefits questions. The familiarity of developing and working with multi-employer funds has given Polar Design the benefit of developing best practices for organizing layouts and creating functionality that caters to Fund Participant needs, such as what information to present on the homepage, navigation priority, and the best order of pages and visual guides to lead the user toward their objective. Polar Designs Taft-Hartley solutions typically include a public site and a secure portal. The information on the public sites is information accessible to anyone visiting the website whereas the secure portal content is protected by a secure member login. Provides members with the ability to obtain accurate calculation of health eligibility, calculation of pension vesting, calculating future pension estimates, contribution reports, COBRA payments, and annuity reports at any moment. A future pension estimator, for example, allows members to obtain a precise calculation down to the penny, involving variables such as contribution rates, years of service, age, marital status, and estimated future hours. Responsive design ensures that the portal scales to different screen sizes and features a separate mobile optimized display for smartphone and other mobile devices. A mobile-friendly website is especially critical because mobile web use exceeds desktop web use. E-signatures allow Taft-Hartley Funds to collect and process documents online safely and efficiently. With e-signatures, a signer is securely associate with a document in a logged transaction. The principal reason to implement social media so deeply is that it will provide the web site with free publicity within member’s social networks, which are likely to include other members. Members that share or like web site content will cause other members to be aware of that content and will increase the likelihood that currently un-engaged members may visit the site and register for classes. This can provide a powerful platform for cost-effective promotion and publicity with the right strategy. Additionally, it provide Taft-Hartley funds the opportunity to demonstrate transparency and customer service by inviting and responding to concerns in the open. This can help manage members’ concerns and prevent minor issues from bubbling up unexpectedly at meetings. A deeper integration includes functionality like publishing of courses to Facebook and Twitter, publishing of course alerts (e.g., class cancellations) to Twitter due to its immediacy, allowing Participants to register for the site using their Facebook account information with a simple click of a button, enroll in courses through Facebook, and share information within the site with their connections in social media such as course registrations, test results, certificates obtained, courses or instructor profiles “liked” in Facebook, or other potential interactions with the web site. 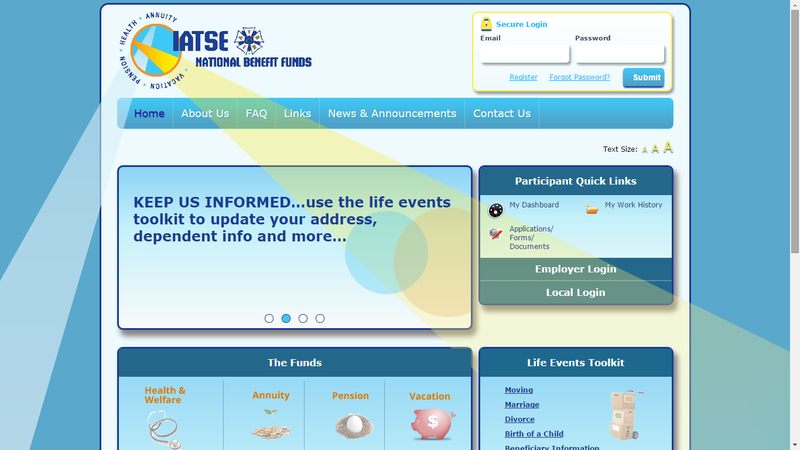 Check out some of Polar Design’s secure benefit portal work here!